It was finally announced by Capcom, one of the greatest games to see the PS2, who would be making its way to the Wii. It seems the only difference between the PS2 version and the new Wii version is the control scheme, but many fans are split on whether they want more improvements. The game will most likely be released in the spring of 2008, with no price announced as of now. Below is the press release. SAN MATEO, Calif. — October 17, 2007 — It’s finally time to experience the magic of Okami™ as it was always meant to be played. Capcom’s award winning game — hailed as “Game of the Year”for 2006 by multiple magazines and websites including Associated Press, PSM, Village Voice, IGN.com, Game Revolution and more — is set for release on the Wii™ home video game system in Spring 2008. 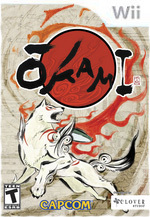 Featuring a re-imagined control scheme built around the intuitive Wii Remote™, Okami offers players an unparalleled level of control and an opportunity to rediscover a critically-acclaimed and beautifully crafted adventure. Okami tells the story of a mythical sun god who sets out to restore a dismal world, decimating the forces of evil who stand in the way by commanding the elements and mythical abilities the deity possesses. Mixing Japanese folklore and a stunning traditional Japanese art style, players must utilize an inventive control scheme to overcome the challenges and evil that await. By enhancing the unique gameplay, visual style and story line of Okami with the control of the Wii Remote, it is sure to be the ultimate version of the game. • Original visuals and revolutionary design– Vibrant and inspiring graphics, reminiscent of traditional Japanese art created on paper scrolls, produce a large variety of stages with a watercolor-esque appearance. This entry was posted on Thursday, October 25th, 2007 at 2:40 pm and is filed under Nintendo. You can follow any responses to this entry through the RSS 2.0 feed. You can leave a response, or trackback from your own site.